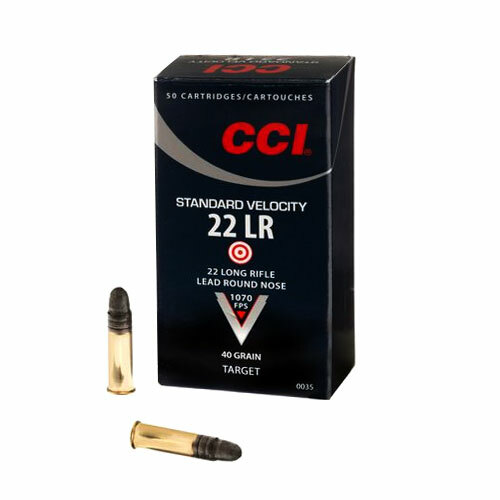 CCI Standard Velocity 22 Caliber 40 GR. Great for Target Shooting for both Rifles and Pistols. All ammo ships only to Continental US only. We cannot ship ammo to: Alaska, Hawaii or Puerto Rico. See detailed restrictions below. Due to the New York state Safe Act, we are unable to ship ammo to New York. We can drop ship to a FFL dealer. Please contact us if you wish to order ammo and are located in New York. You must be 18 or older to order shotgun or rifle ammo and 21 years or older to order handgun ammo. Ammo must ship UPS (domestic) ground. Due to Department of Transportation regulations, we cannot accept returns on ammo. Please check local laws before ordering. Check your state and local laws for any other applicable firearms and ammunition regulations. Due to Department of Transportation regulations, we cannot accept returns on ammo. Please check local laws before ordering.